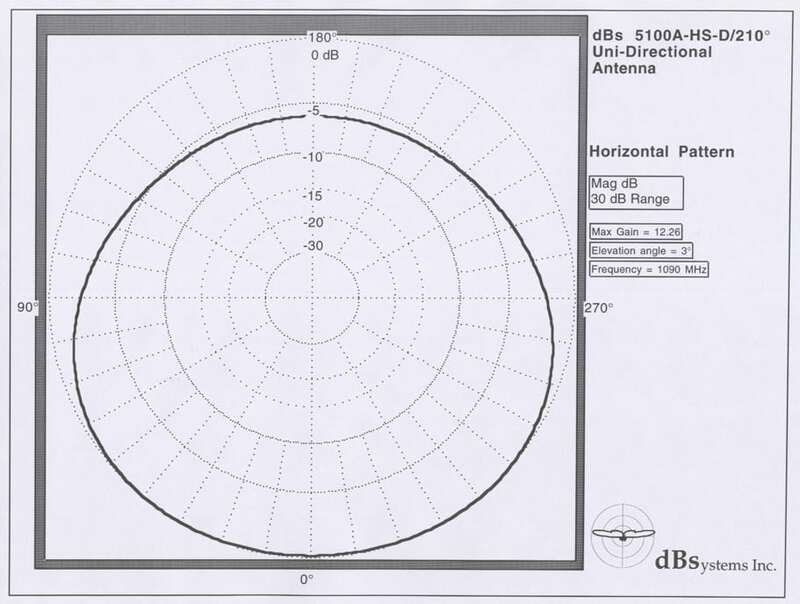 5100A-HS/210° HPBW, Uni-Directional Antenna | dB Systems Inc. The dBs 5100A-HS/210° is a uni-directional broadband, 10 element, high performance, collinear dipole phased array designed specifically for use in special coverage needs of Automatic Dependent Surveillance-Broadcast (ADS-B) system. It includes a high strength radome capable of surviving 180 mph wind loads. 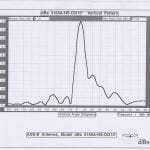 It exhibits very low side lobe levels and negative angle radiation (minimizes multipath). The above-the-horizon null-filled pattern minimizes the radiated cone of silence. The antenna handles input power to 5,000 watts at standard DME pulse duty cycle and operates over its entire frequency range with an input VSWR at 50 ohms of less than 2.5:1. 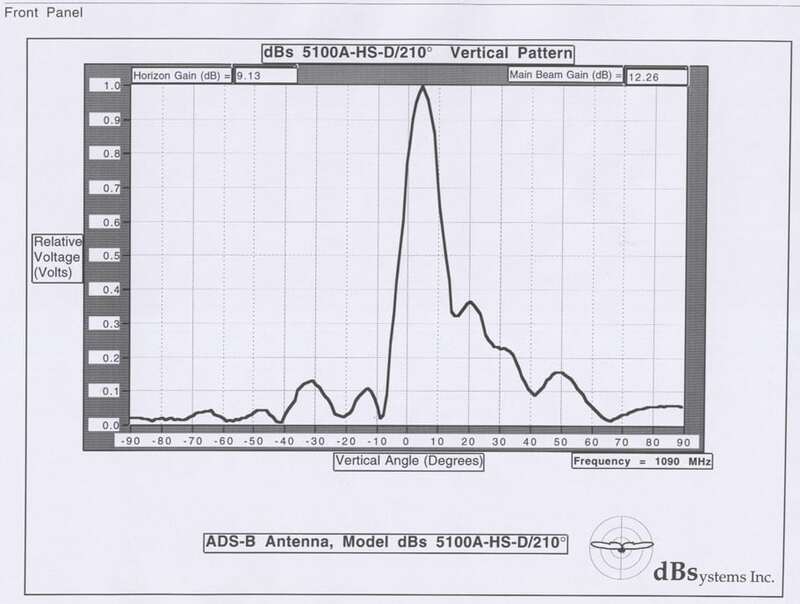 This antenna exhibits the same vertical pattern as the dBs 5100A; however, the horizontal pattern has been modified to produce 6 dB more gain on one side of the pattern as compared to the other side. 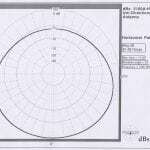 This type of pattern is very useful in areas where twice the range is needed on one side of the antenna. This horizontal beam shaping is accomplished via integral reflecting elements embedded in the oblong section of the radome. This antenna provides vertically polarized, uni-directional coverage with the main beam of radiation tilted upward to minimize the effects of ground reflections. The array has two integral monitor probes which constantly sample the RF signal delivered to the antenna. The array is enclosed and effectively weatherproofed within a high-strength, lightweight, small diameter, filament wound, and ground smooth fiberglass radome for prolonged trouble-free use under severe environmental conditions. The radome and base have been ruggedized to withstand greater wind loading. Mounting is made by means of an integral base flange with 6 each mounting bolt holes. All RF input/output ports are Type N receptacles. The model dBs 5100A-HS/210° ADS-B antenna has been designed for ruggedness, lightweight, minimum size, long life, and in accordance with FAA-E-2754 and FAA-G-2100. Exceeds the requirements of the UK CAA specification. dBs 5100A-HS/210º with Marine Option: The dBs 5100A-HS/210º with Marine option is available upon request. The RF transmission assembly is completely sealed and weatherproofed to protect in harsh environments such as salt water, extreme humidity, wind, sand, snow, and ice. Contact our factory for more details.